La Panadera, 157 m2 is rehabilitated with traditional materials, on the ground floor has a kitchen with dining room, large bathroom, living room with fireplace and garden with barbecue. The upper floor has a double room with a bed of 1.60 cms., And a fixed wooden cradle, a double room, a living room with 4 beds and a toilet. 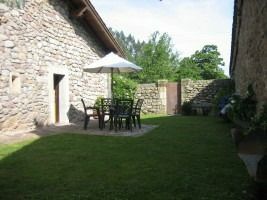 It has a 100 m2 garden with furniture to enjoy it and barbecue. La Cuadra, has at the entrance bathroom, living room with fireplace, dining room, kitchen and porch with barbecue, on the top floor has room with 2 beds, another living room also with TV, double room with bed of 1.60 cms., and terrace. Next to the main entrance is the pilgrim's room, with toilet, in the entrance doorway, on the outside of the house.